This post should’ve seen the light of day more than a week ago but I’ve been bogged down by holiday festivities (Merry Christmas!). And before I get my hands blown at the coming holiday (Happy New Year! ), I better have this out now. Since everyone pretty much knew already what went down in the WMCs over ten days ago, I’ll just mostly do a roundup of what people have posted regarding their experience during the three days of rigorous competition. The competition almost concluded as I predicted in my preview posts with only the odd performance by the Chinese Team and having England and Wales as separate countries that made it turn out the way it did. For starters, here are the official results from the WMC Statistics Website and for a quick glance of the whole event, look here. And for a more firsthand feel of the events, the always entertaining write up by Ben can be found here. Nelson Dellis who ended up 7th overall also has his take on his performance in his website. And the New World Memory Champion.. Johannes Mallow! As everyone and their dog expected, the 2012 World Memory Championship concluded with Johannes Mallow of Germany emerging as the new World Memory Champion. But it didn’t finish though without a heart stopping showdown in the final event, the Speed Cards, to decide who will have the right to be called the Sharpest Memory in the World. With only 332 championship points separating the eventual champion from his compatriot, Simon Reinhard would have needed to repeat this kind of performance to get a chance of winning the title. He needed to log in less than 24.75 seconds to be exact. group to be part of, which means we could expect greater things to come from this guy given the company he’s in. For those who are wondering, it took three years before Andi won his first World Championship and Dr. Karsten did it in nine. Wang Feng was 5th in his first WMC but became the World Champ the following year then defended his title once before retiring this year. It was the highest turnaround from any of the past world champions. We’ll see how Jonas will fare compare to them. Even though the Germans didn’t complete the sweep at the medal standings in the Individual Championships, they still had four out of the top ten with Boris Konrad and Christian Schaefer finishing 4th and 5th respectively. 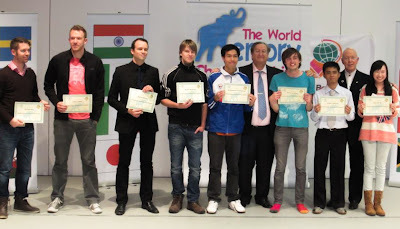 Of the three events that I thought would be broken, only one was made in this year’s World Memory Championship. It was the Abstract Image event that was broken by Johannes Mallow and Simon Reinhard with 434 and 427 points respectively. The previous record was 396 points held by Simon Reinhard at the South German Memory Championship 2012. Another record was almost broken by Johannes when he tied Wang Feng’s five minute random numbers record of 500 digits. When I said that the Spoken Numbers might also be broken, it turned out that Mark Anthony Castaneda only managed to memorize 193 digits but it was enough for him to snag the Philippine’s first ever Gold medal! Yipee! (Technically, the first was Jamyla’s Gold Medal finish at the Hour Cards event in the Kid’s category, but I subscribe to the One Record/No Categories idea with rankings). As it turns out, the Chinese Team had an odd performance. Their representatives’ scores ranged from 4000-5600 points at their National Championships this year but they ended up way below that mark when their highest ranked athlete only had 2994 points at this year’s WMCs. It is noted that their National Tournament have the same events as the WMCs and having their performance dip by a thousand seems quite puzzling to me. But what the heck, that and coupled with having England and Wales as separate countries meant that my country eventually was fighting for the Silver Medal against Sweden! It was much better than what I projected of finishing around 4th – 6th. If it weren’t for that phenomenal performance by Jonas von Essen and some unfortunate circumstances that barred me from competing, we could have ended much higher. But hey, we did get to medal. I’ll just leave it at that. Having said that, there was this comment at Ben’s blog that questions the validity of the competitions, stating that there should be an asterisk in the results as the World Champion didn’t compete; and none of the better athletes from China weren’t there. Much like what happened last year when the Germans decided to sit out in protest. But what can we do? Wang Feng decided to retire and the Chinese Team decided to let the kids have their turn, which I think is better for their long term success. These things happen all the time in any competition. We can’t always get to have all the best athletes compete with each other all the time. New GMs…. and Double GMs? Which makes them Double GMs? Nah, some of these guys would have been triple, quadruple, or whatever number of times GMs, as they did it multiple times already. That’s why I like Ben’s idea of a Double GM better. 2000 random numbers, 20 decks, and under a minute, you double the effort for a GM norm, something that only Wang Feng, Liu Su, Simon Reinhard and Johannes Mallow were able to do. For a further reading on the history and background of the Grand Master Title, I highly recommend you to read that link to Ben’s blog. It is worth the click. That’s it for now, I’ll be posting some other time, if I still have my fingers with me. Happy New Year! Where can I find more information on Johannes Mallow? Anything more to find? He is really amazing.